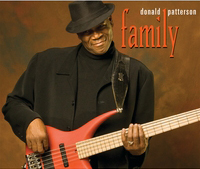 Donald Patterson celebrates Family in his debut CD featuring jazz powerhouses Kirk Whalum, Peter White, Doc Powell and Ron Brown. This is what happens when you have Godly intervention plus a talent that is undeniable. This is what I call honest jazz...it is smooth, cool, and bathed in relaxation. Donald "Judge" Patterson is right up there with the top jazz bass players and has managed to stay humble and grounded. Great job cuz...All I can say is WOW! This is definetly a must have in one's music collection. -Sharlay W.
This is a great cd! Donald plays great as a part of the fine songs, not to make the bass the main instrument, but to make the songs better. This proves Donald is a very serious artist in his own right too, besides all the work he is doing as a sideman. The tasteful playing from the other musicians too are making this a cd to check out to everyone who is into fine fusion/funk/smoothjazz. -Harry S.
I really enjoy your music and style of jazz Don. Calming melodies with creative riffs - my stress relief! - John G.
Hi Donald, I have been working to your cd everyday. It creates a very nice vibe . . . . there's enough of a groove to keep it from fading into the background, yet it is smooth and has a flow so it''s not jarring. I like the vocal touches as well. You're lucky to have such a talented family (or they are lucky to have inherited musical talent from you). I am also playing the cd in my car when riding with friends so I hope that leads a few people to CDBaby to buy it. -Michelle L.
Great flow nice and tasty (as Arnett would say) -Eugene M.
This site is Copyright 2013 Global Music Alternative.